A 12 y/o male with ADHD presents to the ED with a 2 cm laceration on his forearm. Bleeding is well controlled, but he complains of numbness and subjective weakness with movement of his fingers. Initially, the patient provided the history of falling onto a small piece of glass from a nearby broken window. On exam, patient has a 2 cm linear laceration to the medial left forearm. There is some mild surrounding swelling of the laceration which appears firm to the touch, concerning for possible foreign body. Otherwise, the patient has full range of motion and strength of his hand and wrist, intact sensation and soft compartments. An X-ray is ordered to rule out foreign body. The X-ray shows some soft tissue swelling in the area of the laceration but no evidence of foreign body. Upon returning to patient’s room to perform repair, repeat examination of the affected arm shows significantly worsening swelling and patient reports worsening numbness and tingling to the left 4th and 5th fingers. The patient’s forearm is tense and painful to the touch. Orthopedics is consulted for concern of compartment syndrome. At this point, patient reveals that he did not actually fall on glass but instead punched a glass window. He recalls pulling an 8 cm piece of glass from his forearm and admits there was significant blood loss prior to ED arrival. A CBC is ordered with initial hemoglobin of 10.2. The patient is evaluated by orthopedics who recommend ice, elevation and compression dressing with frequent compartment checks in the ED. He does not have any obvious neurovascular injury but it is thought that his symptoms are due to swelling from hematoma formation. Over the next few hours, the patient’s swelling worsens and he complains of an “electric shock” sensation upon passive stretch of his fingers. The patient is evaluated by orthopedics again for concern of increased compartment pressures. Upon undoing his compression dressing, the patient has an episode of brisk bleeding from the wound which results in improved swelling, pain and sensation. This likely represents evacuation of the expanding hematoma. The patient is admitted to orthopedics for continued observation and compartment checks. Overnight, his hemoglobin dropped to 8.4 but he remained hemodynamically stable with no additional episodes of bleeding. His compartments remained soft with improvement in his pain and sensation. He was discharged the following day after repair of his laceration with outpatient PCP follow up. 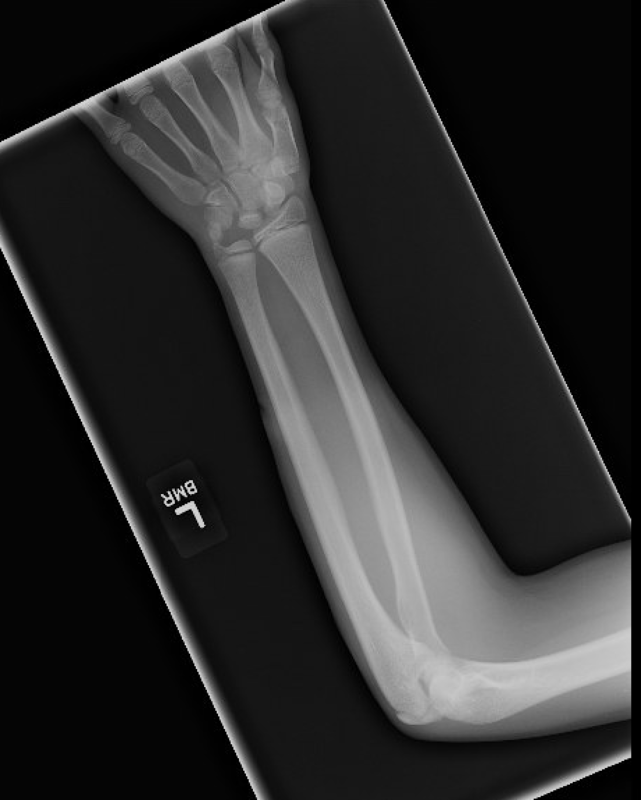 This case emphasizes the importance of having a high level of suspicion for serious underlying injuries in patients who report being injured by glass or other penetrating mechanisms. Not only can penetrating injuries cause direct injury to underlying nerves or arteries, they can also cause indirect injuries due to compartment syndrome from soft tissue injury, similar to the patient in this case. Although this patient did not develop compartment syndrome, many of his symptoms such as worsening pain and paresthesias were due to increasing compartment pressure. This was supported by the fact that they resolved upon evacuation of the expanding hematoma. Often times, initial exam may not reveal any red flags, however serial exams should be considered to ensure that any less apparent injuries are found early on. The exam should include assessing pulses, either by palpation or with Doppler and testing motor and sensation of nerves within the vicinity of the injury. Providers should have a low threshold for admission and getting consultants involved early on as these injuries may progress quickly, as demonstrated with this patient’s rapidly changing exam. It is also important to note that patients’ symptoms may develop several hours or days later, after patients have been discharged. This can be especially problematic in cases of lacerations that were repaired since the expanding hematoma is now contained and cannot spontaneously drain as it did in this patient. This highlights the importance of giving realistic return precautions to patients so they may seek medical attention in a timely fashion if compartment syndrome were to develop after discharge home. Iconomou, Thomais G., et al. “Management of Major Penetrating Glass Injuries to the Upper Extremities in Children and Adolescents.” Microsurgery, vol. 14, no. 2, 1993, pp. 91–96. Gourgiotis, Stavros, et al. “Acute Limb Compartment Syndrome: A Review.” Journal of Surgical Education, vol. 64, no. 3, June 2007, pp. 178–186.